Apparently, the days of all-inclusive cruises are coming to an end. Royal Caribbean, which enjoyed a public relations train wreck in October when it announced it would be charging $15 for its New York Strip Steak, has come up with another surcharge sure to annoy people who select cruises because they're easy. If you want room service between midnight and 5 am, you'll now have to pay another $4 for it. By this Friday, all its ships will have this new fee in place. 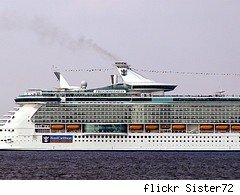 Royal Caribbean promises that there will always be somewhere on the ship you can go to get food without the wee-hours charge. But when you take a cruise, you pay for an all-inclusive experience (or at least you used to), minus booze. Ordering french fries after a night at the disco or having breakfast in the pre-dawn moonlight has always been one of the charms of cruising. That's not a lot of money, but then again, if it's not a lot of money, why charge it? Well, partly because the cruise industry is quickly sliding into the tank. New bookings dropped off when Wall Street did, and vacationers are holding on to their money for the time being. So rather than put themselves in the poor market position of having the higher fare, cruise lines are taking a page from the airline playbook and pestering their customers with charges for things that, up to now, were free. Right now, those charges are for things that not everyone will use (steak dinners, midnight munchies), which is what allows them to be slipped onto the bill with a minimum of fuss. But the many people who book cruises because they're convenient don't really want to be told that they need to be upcharged for it now. Unsurprisingly, Royal Caribbean's website does not directly disclose the amount of the fee, which is another sign that it would rather that the customer look the other way when these things are implemented.